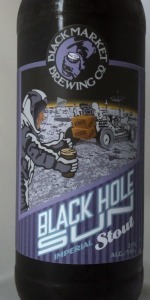 Home Beers Black Market Brewing Co.
Black Hole Sun | Black Market Brewing Co.
name Black Hole Sun, but now is named Dimitri. This pours black with 1 finger dark brown lace which quickly disappears. The aroma is sweet chocolate, bourbon, dark fruits, ans malts. from the malts and hops. The bourbon is not to strong for a 15% RIS. This is also a very thick chewy stout. The bourbon coats your palate nicely. This is a very good Stout. I will be buying some bottles when they come out. This beer is just big, heavy, sweet, and delicious. This is an extremely heavy stout with an extremely high alcohol content. If you love stouts then this is about as good as a stout gets. Poured a deep, dark, inky black with minimal head and a bit of lacing. Aromas were subdued compared to what I was expecting, plenty of spice and cocoa but not super-pungent. Flavor is complex yet drinkable - too drinkable. This beer is 15% ? You would have no way of telling until it hit you later on. Some syrup sweetness but it's not too much, very little alcohol burn, mostly delicious cocoa and some pecan pie. Goes down smooth. Too smooth. Dangerous. Fabulous. One glass was plenty for me. Poured into a Fremont small snifter. Pours pitch black with a thin dark brown head that leaves a thin ring around the glass and light lacing. Big aroma of dark toasted malts, molasses, cocoa and licorice. Flavor follows aroma, bit molasses, licorice, dark dried fruit, chocolate, finishing with very concentrated flavors, as if figs, dates and molasses were reduced to a thick liquid. Medium to heavy bodied with some creaminess. A big, fully flavored imperial stout. Although it is warming, but flavors are so dense that the monster ABV is well covered. It took a real effort to pace myself to not drink this too fast. A beer equivalent of a liqueur. The dark malts are somewhat buried by the other flavors, but an interesting flavor profile sets this apart from other RIS. Nicely done. Black Hole Sun from Black Market Brewing Co.